For the first time, images from NASA’s New Horizons spacecraft are revealing bright and dark regions on the surface of faraway Pluto – the primary target of the New Horizons close flyby in mid-July. The images were captured in early to mid-April from within 70 million miles (113 million kilometers), using the telescopic Long-Range Reconnaissance Imager (LORRI) camera on New Horizons. A technique called image deconvolution sharpens the raw, unprocessed images beamed back to Earth. New Horizons scientists interpreted the data to reveal the dwarf planet has broad surface markings – some bright, some dark – including a bright area at one pole that may be a polar cap. Also captured in the images is Pluto’s largest moon, Charon, rotating in its 6.4-day long orbit. The exposure times used to create this image set – a tenth of a second – were too short for the camera to detect Pluto’s four much smaller and fainter moons. Since it was discovered in 1930, Pluto has remained an enigma. It orbits our sun more than 3 billion miles (about 5 billion kilometers) from Earth, and researchers have struggled to discern any details about its surface. These latest New Horizons images allow the mission science team to detect clear differences in brightness across Pluto’s surface as it rotates. The images the spacecraft returns will dramatically improve as New Horizons speeds closer to its July rendezvous with Pluto. “We can only imagine what surprises will be revealed when New Horizons passes approximately 7,800 miles (12,500 kilometers) above Pluto’s surface this summer,” said Hal Weaver, the mission’s project scientist at the Johns Hopkins University Applied Physics Laboratory (APL) in Laurel, Maryland. From a NASA news release. Clear skies look unlikely for our planned Public Open Night scheduled for Saturday. 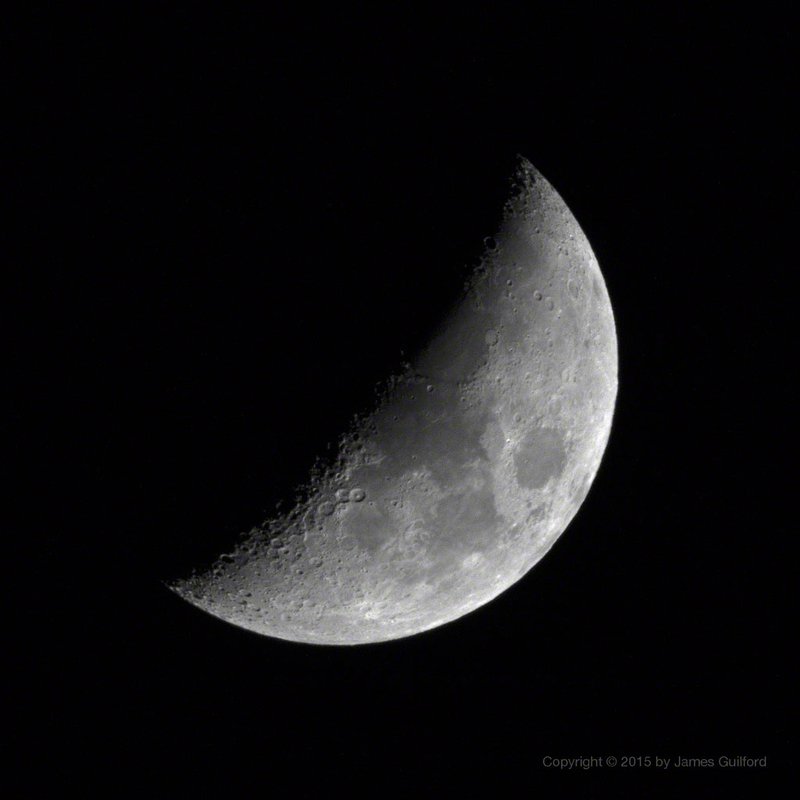 So here’s a look at Friday night’s Moon. I captured this with my camera and a telephoto lens and it turned out pretty well. I must say, however, that visitors viewing Luna through the Observatory’s grand old telescope get a much better view than I’m displaying here! Still, we’ll point out a few things here that we would mention if we were looking through the telescope… First, look along the edge of the Moon’s disk as it is contrasted against the blackness of space; note how it’s a bit uneven? The lumps in the disk’s edge are actually mountains and crater rims on the sides of the Moon’s globe! See the “smile” line on the inner edge of the Moon? That line divides the lit and unlit portions of the Moon and is called the terminator. In this, the waxing gibbous phase, the terminator represents sunrise on the surface. 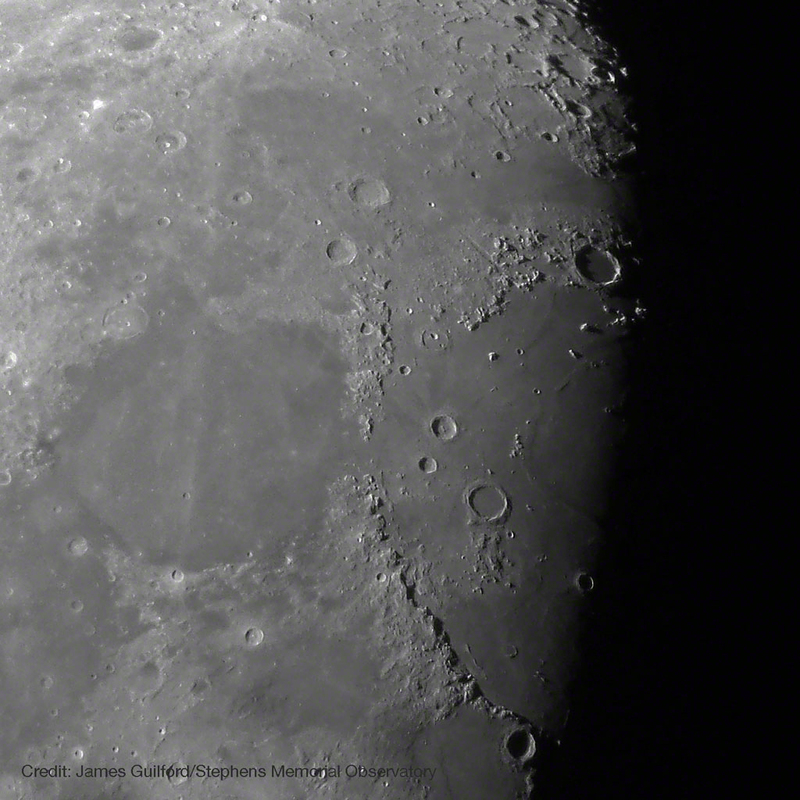 As on Earth, sunrise shadows are long and those long shadows and low-angle sunlight bring out details in the craters and mountains (for even greater detail, see this image from last month). The bright ray-lines projecting from some of the craters are light-colored material “splashed” out of the crater sites as they were formed by asteroid hits; they mark newer craters. Also note the central peak in at least one of the craters – material thrust upward as shock waves from collisions bounded back, inward, from the forming crater walls. Old Luna is full of amazing sights, if only we will see them! Richmond Hill, ON – In what astronomers might describe as “stellar news,” Corsica Development Inc. is donating the David Dunlap Observatory (DDO) to the facility’s long-time stewards – the Royal Astronomical Society of Canada, Toronto Centre. The observatory is 80 years old this year. It houses what is still the largest optical telescope in the country with a mirror measuring 74 inches (1.9meters) across. The decision was made in 2012 by Corsica to transfer the Administration Building and Dome to an agency that would honor the spirit of the Observatory and ensure its long-term viability. Members of the RASC Toronto Centre have been managing and operating the David Dunlap Observatory for the last six years and are the resident experts. Corsica, which purchased the 190 acre Observatory property from the University of Toronto in 2008, is also donating nearly 100 acres of the land to the Town of Richmond Hill. The historic buildings will continue to be a centre for education and science literacy for the community. For the last six years RASC Toronto Centre member volunteers have managed the facility and provided hundreds of award-winning educational and outreach programs to York Region families and students. They’ve done so without the use of local tax dollars. Centre members say they’re looking forward to working collaboratively with the town on new programs and projects that will continue to benefit town residents. Please see the announcement on www.theDDO.ca for more information. 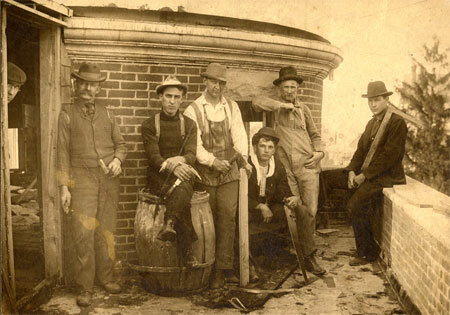 Stephens Memorial Observatory of Hiram College will be open to the public on Saturday, April 25, from 9:00 to 10:00 PM. On the observing list for the night are: Jupiter, Beehive Cluster, M3 Star Cluster, and the Moon. Cloudy skies cancel the event! Trees to our west may interfere with viewing of both the Moon and Jupiter later in our session, so earlier arrival would be good. The Observatory is located on Wakefield Road (Rt. 82) less than a quarter of a mile west of Route 700 in Hiram. For updates and more information, see the observatory’s Web site: StephensObservatory.org or “@StephensObs” on Twitter. No reservations are required and there is no admission fee for observatory public nights. Cloudy skies at the starting time cancel the event and, in that case, the observatory will not open. There is no parking at the Observatory. Visitors may park on permissible side streets near the Post Office, a short distance east of the observatory. Saturday morning will afford most of North America the opportunity to see a beautiful, if brief, total lunar eclipse; that opportunity does not extend to those of us located in Northeastern Ohio. Our missed opportunity is a matter of location and timing: the partial phase of the eclipse will begin for us at 6:16 AM EDT and the eclipsing Moon will set at 7:10 AM. Sunrise is at 7:05 AM. At best, we will see a shadowy edge missing from the Full Moon as it sinks below the horizon and is obliterated by dawn’s light. We will miss the dramatic “totality” phase entirely. Eclipse watchers farther west of us will witness the shortest lunar eclipse of the century with totality lasting only about five minutes. This eclipse marks the third in a series of four lunar eclipses in a row, known as a “tetrad.” The first in the series occurred on April 15, 2014, the second in September of 2014, and the final will be Sept. 27, 2015. During an eclipse, the moon often looks coppery or reddish because sunlight has passed through Earth’s atmosphere, which filters out most of its blue light. This eerie, harmless effect was understandably frightening to people before its cause was understood. For a total lunar eclipse to happen, the moon must be Full, which means it is directly opposite the Sun, with Earth in between. The Moon moves into the shadow cast into space by the Sun shining on Earth. An eclipse does not occur every month because sometimes the Moon is above the shadow and sometimes below. Take heart, Ohioans, for we will have a grand eclipse viewing opportunity later this year! The September 27 total lunar eclipse will take place before midnight and we will be able to witness the entire event, if the skies cooperate! Note: This story includes some material from a NASA news release. Welcome to the new online home of Stephens Memorial Observatory! We are moving from our traditional static page website to the WordPress CMS platform. The transition shouldn’t take long but, in the short term, some of the previous content may be missing. Check the page menus to find important items such as our Open Nights schedule and Contact information. I can’t say as I blame them, the people who didn’t show for our observatory open night Saturday, March 28 — only seven braved the cold. After all, the temperature was about 19° (F), darned cold! But the sky was clear and the waxing Moon was high in the sky. Both Moon and Jupiter were sharing constellation Cancer with The Beehive star cluster (M44). 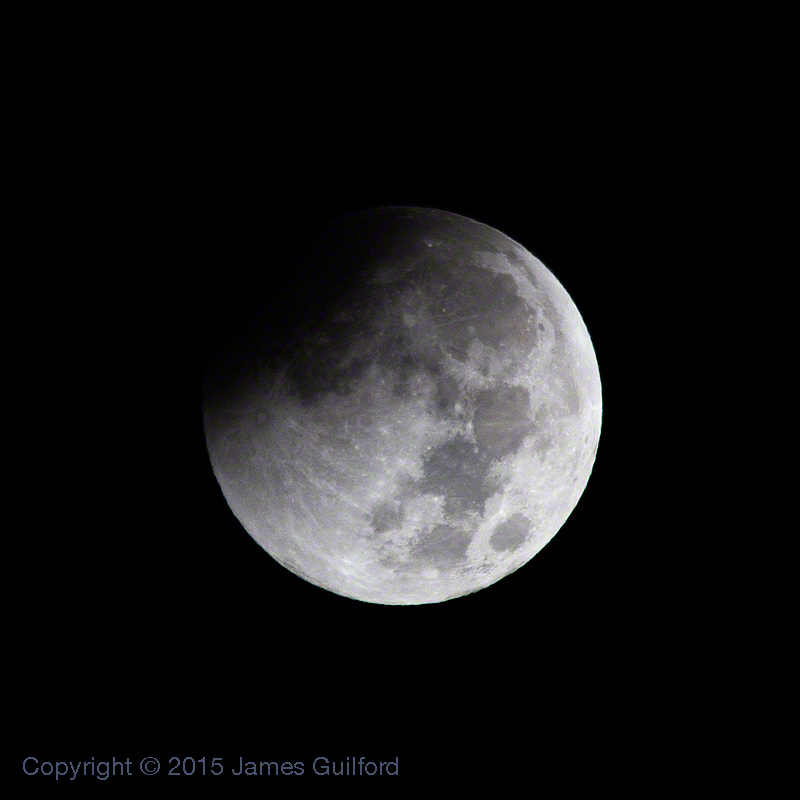 Still, those sensible people who stayed home and warm missed a glorious view of old Luna. In my idle time waiting for visitors, I tried out a little afocal astrophotography using the observatory’s 9-inch Warner and Swasey telescope (ca. 1901) and my little Samsung Galaxy Camera 2 all-in-one. Most shots were a little shy of sharp, and all had some degree of chromatic aberration, and all had a big chunk of image missing where our century-old star diagonal is missing a bit of glass. One shot, however, did work out well, especially after a little fix-up including conversion to monochrome to eliminate color fringing. Not long after the last of our brave visitors left, I caught sight of the indistinct reappearance of Jupiter’s Great Red Spot and that was it… time to close up and go home. My toes needed to be thawed.